I am really enjoying this series so far. I only wish I had read them sooner, I know that younger me would have been obsessed! Since reader the Odyssey in high school I have been a huge fan of Greek mythology. 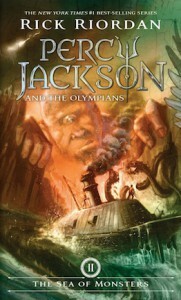 I like the way Rick Riordan twists the ancient myths into modern tales, including positive themes of friendship, courage, and good trumping over evil. These books are quick reads and very entertaining, especially the author's witty humor which can be appreciated by readers of all ages.